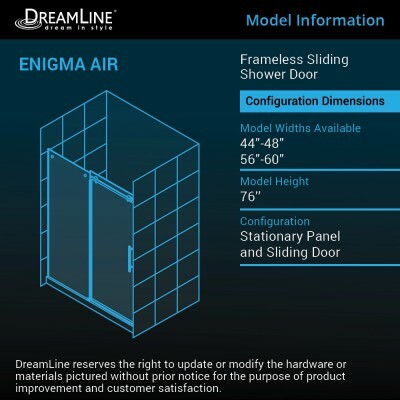 Enigma Air Sliding Shower Door is rated 4.8 out of 5 by 6. Rated 4 out of 5 by Veronakid from Great look Because of spacing a hinged door would not work, and this slider did the job nicely. Quality rollers make for a very smooth sliding operation. Though professional installation is called for, we did the job ourselves. If you have good mechanical skills you can do this job. It is a 2 person job though, and every thing needs to be perfectly level and plumb. This is a quality door with great finishes and looks. Rated 5 out of 5 by DL1234 from Awesome shower door Install was a little difficult and stressful for a DIY but came out nice and we love it. Recommend two people to install. Glass is easy to clean especially if using squeegee and soft towel. Love the design and smooth function of the door and 3/8" glass. Rated 5 out of 5 by Randy from Great product, great price, fast delivery! 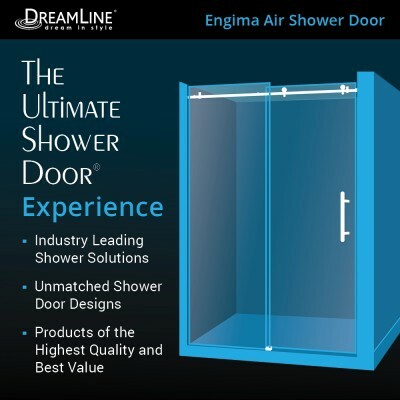 Really love my Dreamline Enigma shower door. The chain stores did not stock this particular door but we really like it. Could not find a better price on a great door and the shipping was super fast. Rated 5 out of 5 by Randy from president I installed my Dreamline Air shower door this week and I am so thrilled. Its a beautiful addition and it is so smooth. It makes our shower look so beautiful and it is very easy to maintain. 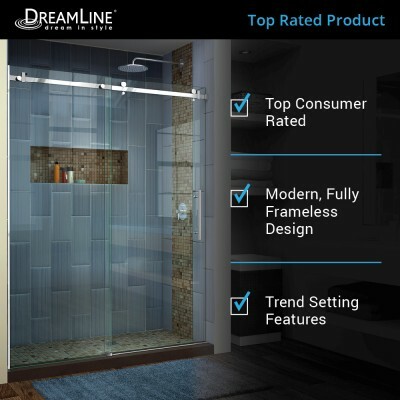 Rated 5 out of 5 by Amar22670 from Love this Dreamline Shower Door I bought this over the summer and it is beautiful. Exactly what we wanted. We don't need the anti-splash guard on the tile across the opening because we have a curbless opening on a floor that slopes to the drain. Is there any problem with removing the guard? Thank you for your interest in DreamLine Shower Doors! It is not required to install the Anti-splash Threshold for the Enigma Air model that you referenced. The Anti-splash Threshold is used to help prevent water from escaping the shower space. If you do not install this part, please keep it in case you want to install it in the future. 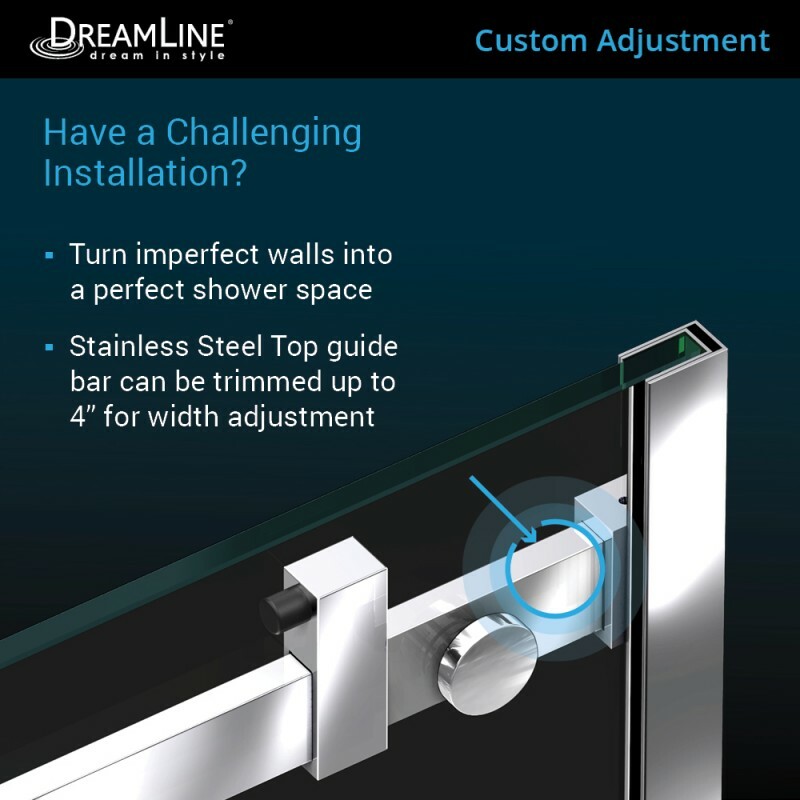 Again, thank you for contacting DreamLine Shower Doors! If you have any other questions, please contact the DreamLine Customer Support Team at 866.731.2244. We are available 8am-6pm EST, Monday through Friday and will be happy to answer any questions you may have. You may also send an email to support@dreamline.com or use our LiveChat feature on DreamLine.com. 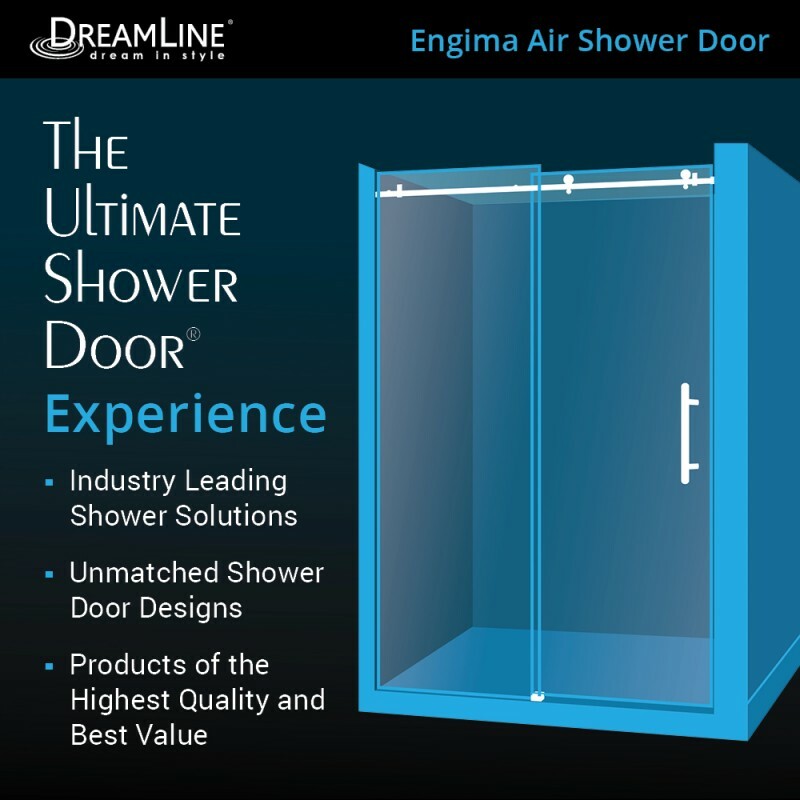 i purchased a set of dreamline doors, but the plastic wipes are too small (wide)...are there wider wipes available for purchase? Tilla, I'm assuming you are getting water between the doors, I too have this problem, did you find a solution? Can this unit be installed on an acrylic shower surround? Can this shower door be installed on a tile floor with no threshold? Thank you for reaching out to DreamLine. Yes, the Enigma Air can be installed directly to a tiled floor. You will want to make sure that you caulk well over any grout lines at the base of the stationary. If you have any other questions, please contact the DreamLine Customer Support Team at 866.731.2244. We are available 8am-7pm EST, Monday through Friday, and Saturdays from 9am to 5pm EST and will be happy to answer any questions you may have. You may also send an email to support@dreamline.com or use our LiveChat feature on DreamLine.com. Thank you for considering DreamLIne! Would the 60 inch Enigma Air sliding door fit a 60.5 inch opening? Thank you for reaching out to DreamLine. Unfortunately, a 60&quot; Enigma Air will not fit a 60-1/2&quot; opening. The upper guide rail is not designed to be used for an opening greater than 60&quot;. 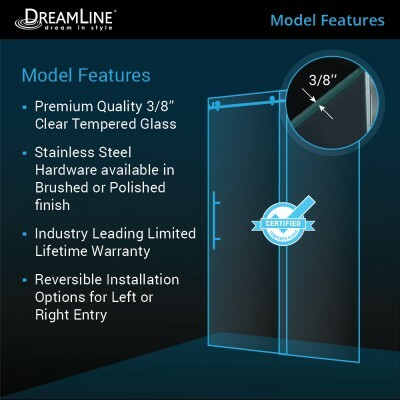 This is something that DreamLine's Custom Glass Group will be able to help you with, however. Your retailer will need to send an email to customglass@dreamline.com with your finished dimensions and specifications. Our Custom Glass Group will return a quote to your retailer within 1-2 business days for you to consider. If you have any other questions, please contact the DreamLine Customer Support Team at 866.731.2244. We are available 8am-7pm EST, Monday through Friday, and Saturdays from 9am to 5pm EST and will be happy to answer any questions you may have. You may also send an email to support@dreamline.com or use our LiveChat feature on DreamLine.com. Thank you for considering DreamLine. What is the tile called in the picture shown? We would like to build our shower with everything shown (including the door); however, we can not find any tile that looks like this. Thank you for reaching out to DreamLine. The tile shown in the photos is a graphic representation of tile, not an actual tile that I can name for you. Please reach out to your local tile showroom for something similar. The frameless nature and minimal hardware of the Enigma Air will make a beautiful showcase for distinctive tile! Have fun shopping for your tile! If you have any other questions about the Enigma Air, please contact the DreamLine Customer Support Team at 866.731.2244. We are available 8am-7pm EST, Monday through Friday, and Saturdays from 9am to 5pm EST and will be happy to answer any questions you may have. You may also send an email to support@dreamline.com or use our LiveChat feature on DreamLine.com. Thank you for considering DreamLine! We have a shower opening of 42 inches and would really like to get sliding frameless doors. Would any of your sliding shower doors accommodate a 42 inch opening? Thank you for reaching out to DreamLine. Unfortunately, for an opening 42&quot; wide, we do not have anything in our stock product line to accommodate that. This may be something that DreamLine's Custom Glass Group may be able to help you with, however. 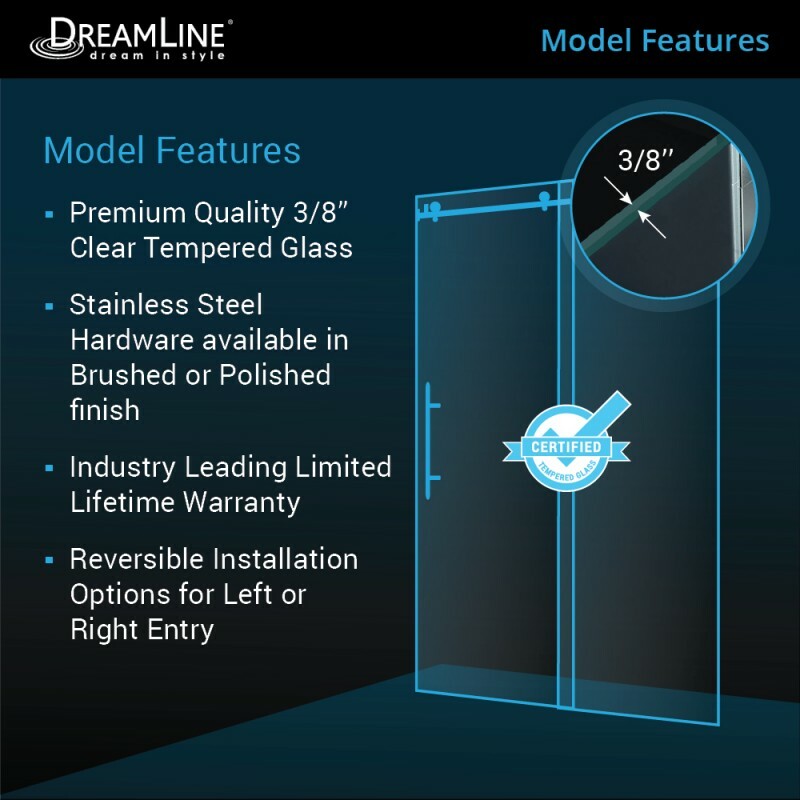 Your retailer will need to send an email to customglass@dreamline.com with your finished dimensions and specifications. Our Custom Glass Group will return a quote to your retailer within 1-2 business days for you to consider. If you have any other questions, please contact the DreamLine Customer Support Team at 866.731.2244. We are available 8am-7pm EST, Monday through Friday, and Saturdays from 9am to 5pm EST and will be happy to answer any questions you may have. You may also send an email to support@dreamline.com or use our LiveChat feature on DreamLine.com. 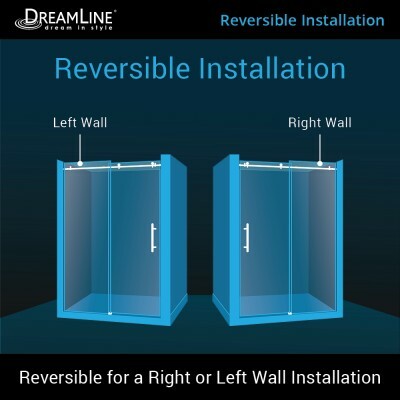 Thank you for considering DreamLine! What&rsquo;s the difference between the enigma air and enigma x? Thank you for reaching out to DreamLine. The main differences between the Enigma Air and the Enigma-X shower doors are the design of the hardware. The Enigma Air features a square upper guide rail and less noticeable hardware for a more contemporary look. The Enigma-X features a round upper guide rail and the rollers are a little larger, but still a very cool, contemporary look. The quality of the stainless steel hardware and 3/8&quot; thick glass is exactly the same, however. 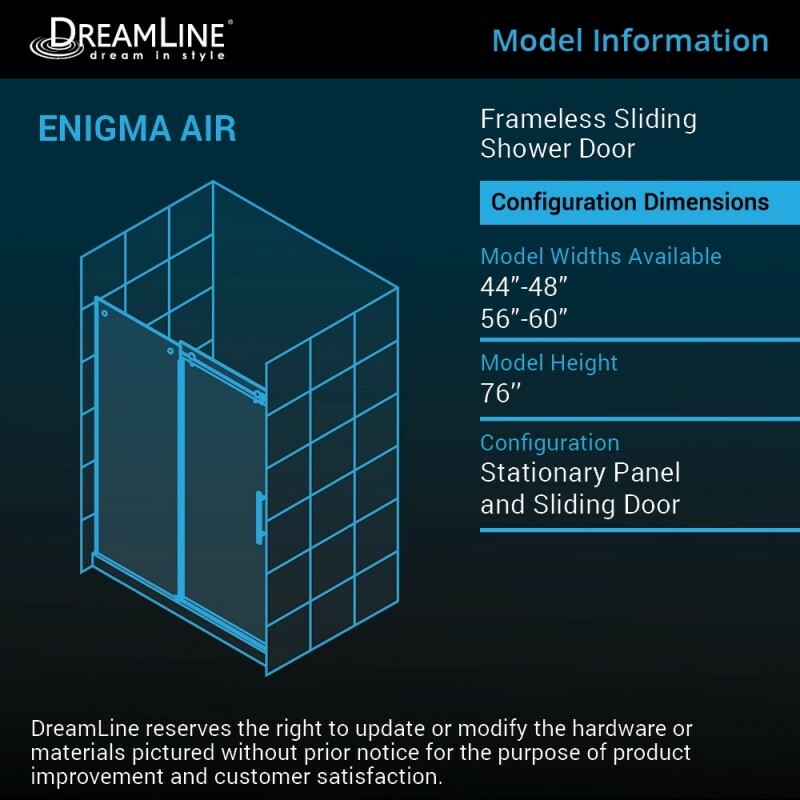 The Enigma Air requires a minimum threshold depth of 2-1/4&quot; while the Enigma-X does require a minimum threshold depth of 2-3/4&quot;, so please measure the threshold of your shower base before choosing. Both doors require plumb walls, so it is wise to place a 4' or 6' level on your finished walls to check for out of plumb conditions. Either door would be a stunning choice for your shower! We hope this information is helpful. If you have any other questions, please reach out to DreamLine's Customer Support Team at 866-731-2244 or by emailing support@dreamline.com. We can also be reached on our LiveChat feature on DreamLine.com. We are available M-F from 8am-7pm EST and Saturday from 9am-5pm EST. 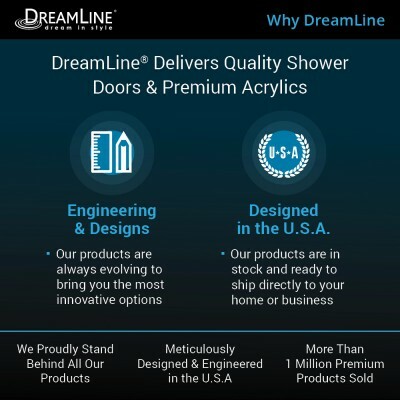 Thank you for considering DreamLine!